This is the first of my posts showing the furnishings from Ackermann’s Repository. These two chairs are from his first series dated January 1809. 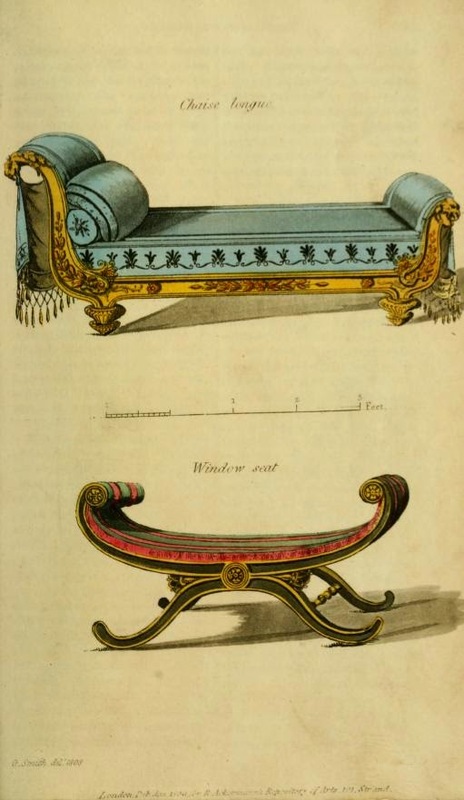 The design of the chaise longue is Grecian, and should be executed as to its frame-work wholly in mat and burnished gold, when chasteness of execution is desired; the ornaments may be finished in bronze metal, when a similar style has been adopted in the other furniture of the apartment. The cover here shown is suppose to be of azure blue velvet, the ornaments being worked up in gold colour and bronze. Each end has a Grecian mantle, to correspond with the covering, fringed with gold-colour silk fringe. One side of this design being geometrical, a scale is added, from which every dimension may obtained, observing that 28inch. Is its intended width. This design would have a very good effect executed in bronze, with the rosettes, frills, and other ornaments of the frame, in mat gold. It might be covered with green velvet, with stripes of rose colour. The design of this window-seat was furnished by Messrs. Morgan and Saunders, Catherine-street, Strand.